Keep Picoma’s steel and aluminum elbows in stock to help your customers connect electrical conduit in even the tightest corners. They’re 100% made in America. 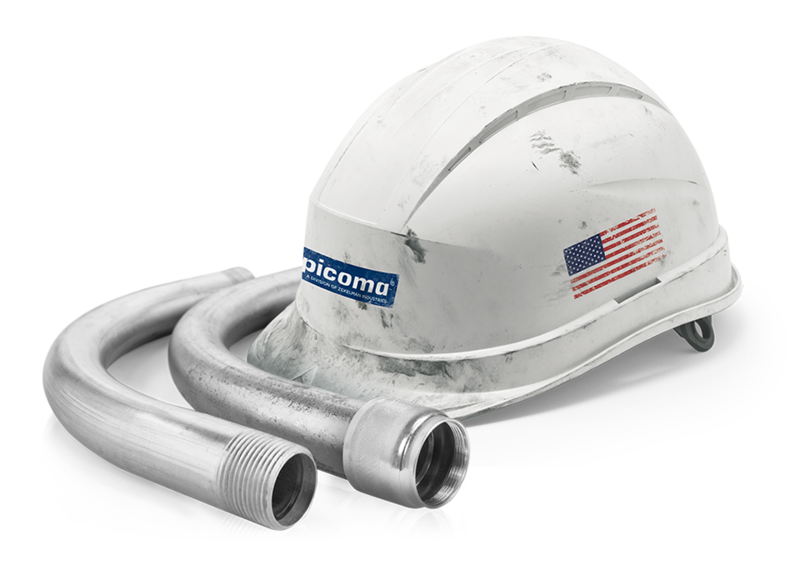 Contractors depend on Picoma’s elbows to connect steel EMT and rigid conduit, as well as aluminum rigid conduit. Our specialized hot-dip and in-line galvanized products set the benchmark for quality in the industry. We manufacture our elbows in Cambridge, Ohio, from conduit stock produced in-house, then further fabricate and ship to local warehouses across the country. Select from our full line of 90° and 45° galvanized steel EMT elbows. These elbows comply with ANSI® C80.3 and UL-797, to which they are Listed. Special-radius 90° EMT elbows are also available. 2½ and larger shipped in palletized cartons or bulk. Stock Picoma’s 90° galvanized steel rigid conduit elbows. They can also be used with intermediate metal conduit (IMC). Our rigid conduit elbows comply with ANSI® C80.1 and UL-6, to which they are Listed. Special-radius 90° rigid elbows and yard-light elbows are also available. Picoma manufactures a complete line of elbows for lighter-weight aluminum electrical systems. Select from 90° and 45° aluminum rigid conduit elbows that comply with ANSI® C80.5 and UL-6A, to which they are Listed. Special-radius 90° rigid conduit elbows are also available. Need elbows with a non-standard radius? We’ve got them in steel and aluminum.